Lost & Found …Within No Time At All ! Power Cell: CR 2032 Lithium Button Cell (it is replaceable and easily available). Lost & Found: The device removes the annoyance you might feel while searching for your mobile phone or other handy gadgets. The device, which works through a robust mobile application, allows the users to pair each of their gadgets to the smartphone. By doing so, you can easily see the status of your lost item. The tracker will not only show you whether or not the lost item is within a 100 feet radius, but its loud beep will also help you locate the lost item without dropping a sweat! Calls for Help: It is always wise to stay ready for a sudden emergency. And when you are in an emergency, taking out the mobile, going through the contact list and making a call or sending a SMS seems a really long process. Dromos BT removes all that. There is a feature in the app which would allow you to select emergency contact and the SMS text to be sent out. So, when you are actually in an emergency situation, the smart device automatically calls and then sends out a SMS with your exact location, that opens in Google Maps. Meaning your help will arrive sooner! Take those shots, you never took: There are many instances, when you cannot take that perfect shot (even when there is front and rear cameras in your mobile). 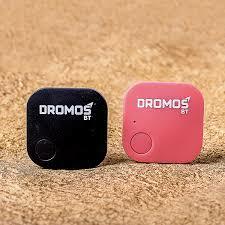 Pair Dromos BT with your mobile, and when you are about to take the shot just utilize the camera feature in the device. It will allow you to take better shots each time. With a reasonable price tag, the product could be a great purchase to bring some extra sense of convenience to your life.